But what do these changes mean for your optometry practice? EyePegasus Ambulatory EHR version 2.0 is 2014 Edition compliant and has been certified by an ONC‐ACB in accordance with the applicable certification criteria adopted by the Secretary of the U.S. Department of Health and Human Services. This certification does not represent an endorsement by the U.S. Department of Health and Human Services. Electronic Prescribing including Medication CPOE, drug-drug/drug-allergy interaction and formulary checks (see below). These additional costs and fees render access to the capabilities above across all clinic locations. This functionality allows users to send and receive Direct-based messages to/from other users of certified health IT systems. Direct messages may include clinical data, notes, and other information. A one-time setup fee will be charged to activate the connection between the customer and the HISP with which EyeTcare has a relationship. In addition, an ongoing monthly cost will be charged per doctor to maintain the connection. All costs are passed on to the customer(s) who requests the connection. The monthly fee includes an unlimited number of transactions within any time frame. To activate the HISP connection, the customer has to enter into a separate user agreement with the HISP. EyeTcare will facilitate the process of engaging the customer with the HISP. Storage and archiving of Direct messages on EyeTcare’s hosted, HIPAA-compliant servers is included with the one-time licensing and subscription fee at no additional charge. No other storage or archiving options are currently available. Pursuant to EyeTcare’s security policy, the Direct messaging capability is restricted and users will be unable to exchange messages with users of third-party HISPs with whom the developer does not have a trust agreement. Should a provider wish to establish a connection with another third-party HISP with whom EyeTcare currently does not have a relationship, the provider must lodge a service request identifying the third-party party HISP along with contact information for the HISP. For a one-time setup cost and a monthly recurring fee charged to the customer, EyeTcare will establish, maintain and support technology to manage the connection. Third-party HISPs must agree to EyeTcare’s connection and trust agreement. EyeTcare will make every effort in good faith to establish such connectivity within a reasonable time frame. However, we do not warrant that EyeTcare will be able to establish agreements and required connections with all third-party HISPs. Messages archived on EyeTcare’s hosted, HIPAA compliant, servers will be retrieved and furnished to the provider within 5 business days of a written request being received by EyeTcare. Electronic prescribing (e-prescribing) allows providers to electronically send and manage medication prescriptions. 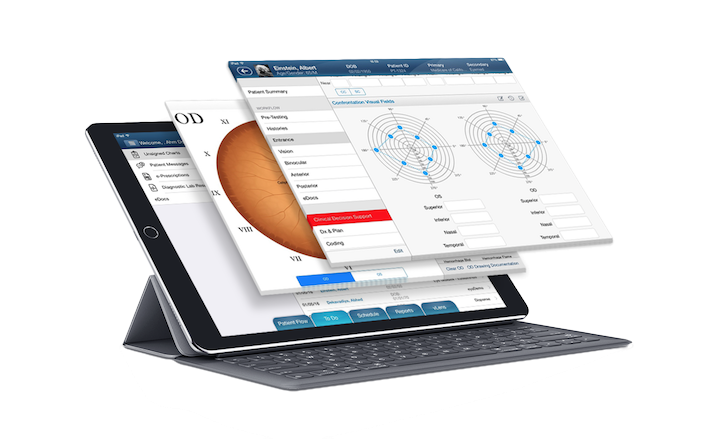 Through EyeTcare’s integration with an e-prescribing portal, this capability also allows providers to perform medication CPOE, drug­-drug/drug­-allergy interactions and formulary checks. Medication CPOE is the process of a healthcare provider electronically entering and managing medication orders. Drug-drug interaction checks ensure that patients do not receive medications that are known to interact with other medications the patient may be taking. Drug-allergy interaction checks ensure that patients do not receive medications that they are allergic to. Formulary checks is the automatic process of referencing the drug formulary provided by insurances to identify drugs that offer the greatest overall value. A one-time setup fee will be charged to the customer to activate the e-prescribing capability, which includes medication CPOE, drug­-drug/drug­-allergy interactions and formulary checks. In addition, there is a recurring monthly fee that is charged per doctor user. The customer is required to enter into a separate licensing agreement with the e-prescribing third party with which EyeTcare has a relationship. EyeTcare will facilitate the customer’s engagement with the e-prescribing third party. The monthly fee allows for unlimited usage of all e-prescribing capabilities that are covered under the user agreement furnished by the e-prescribing third party, including unlimited number of electronic medication prescriptions, unlimited medication CPOE transactions and unlimited drug­-drug/drug­-allergy interactions and formulary checks. EyeTcare does not provide a connection to any other e-prescribing portal at this time. In order to access the capabilities to send electronic medication prescriptions, process medication CPOE and perform drug­-drug/drug­-allergy interactions and formulary checks, the customer is required to utilize EyeTcare’s established e-prescribing integration. All e-prescribing transactions are stored in HIPAA-compliant servers provided by the e-prescribing third party, which is included with the one-time licensing and subscription fee at no additional charge. No other storage options are currently available. To retrieve those transactions for storage in the customer’s owned server, the customer must contact the e-prescribing third party directly.